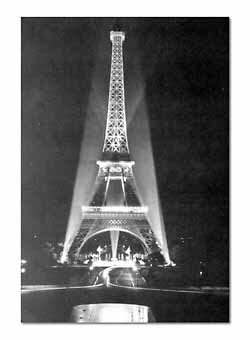 Glittering pre-war Paris had all sorts of reputations; to scholars, it was the most civilized and cultured; to the American colony, it was the gayest; to Parisians and their converts, it was the most beautiful city in the world. Slightly less alluring after four years of German occupation, the French capital, nevertheless, served well many thousands of American fighting men. Handicapped by a 48-hour time limit, T-Patch tourists budgeted their minutes cautiously,. learned that the Yanks of 1918 were not kidding. In one large two-hour gulp, bus guides pointed out the Eiffel Tower, the Arc de Triomphe, the Cathedral of Notre Dame, Napoleon's Tomb and comparable sights. Men strolled the Champs Elysees, viewed the Louvre's deleted collections, motored out to Versailles, dated vivacious Parisiennes, took in a performance at the Opera, had a wonderful time. Soilders ride a fiacre along the Champs Elysees in Paris. Stockingless bicyclers were numerous. 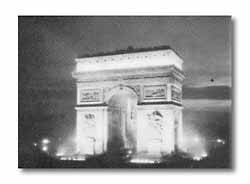 The Arc de Triomphe, started in 1806 by Napoleon to commemorate his victories, was high on sightseeing lists. When the Stage Door Canteen was opened in Paree, Maurice Chevalier was on hand to sing "Mimi."